Peter Pearse, Larkinites and the German submarines: American coverage of the 1916 Rising. | Come Here To Me! « Doing her bit for Ireland. Peter Pearse, Larkinites and the German submarines: American coverage of the 1916 Rising. 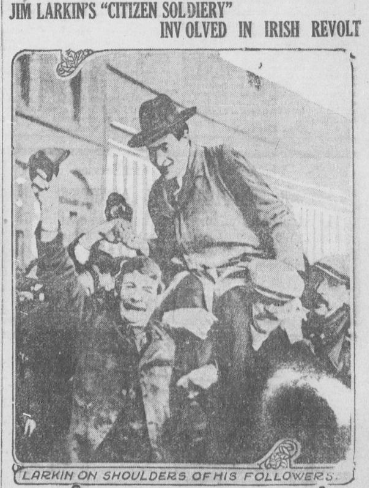 The Daily Capital (Oregon) reports on the involvement of followers of Jim Larkin in 1916 rebellion. 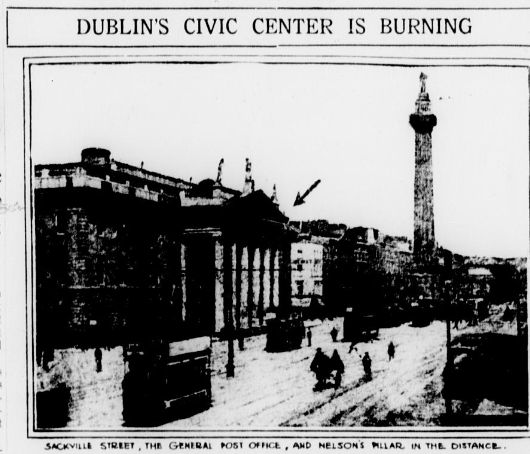 It’s almost a century since the Easter Rising broke out on the streets of the capital. Today, news travels quickly throughout the world with an international press and ever evolving technology, but how was the 1916 reported internationally at the time? The U.S Library of Congress website gives us a good idea, with thousands of editions of U.S newspapers from the period digitised. Breaking the news of rebellion in Ireland. Oklahoma City Times, 29 April 1916. There was a general report today in circles that have been interested in Irish Nationalistic propaganda that the Dublin insurrection had been almost completely successful, and that the Irish Volunteers had captured and held as hostage Lord Wimborne, Lord Lieutenant for Ireland, and other high English officials. Some very German looking ‘Irish Patriots’ on the front of the Washington Herald, 1 May 1916. Not content with German submarines in the Irish seas, some news sources began to make claims that German bodies were being discovered in the rubble of Dublin. On 1 May, the New York Tribune noted that “‘bodies of two German leaders reported found in Dublin.” According to the paper there were rumours that German bodies had been found in the rubble of Sackville Street. This was likely misinformation coming from London outlets, but it was often taken at face value. Just how deep James Larkin, the turbulent Irish labour leader, and his followers are involved in the Irish revolt is not known, but it is not to be doubted that the man who preached firey opposition to government in 1913 will take advantage of the disturbances in Ireland. The strength of Larkin’s followers in Ireland was grossly exaggerated, with the El Paso Herald for example claiming on 29 April 1916 that the “rebel forces numbered about 12,000, of which 2,000 were Larkinites and 10,000 were Sinn Féiners.” In reality, there were about 1,500 rebels out in Dublin, and the Irish Citizen Army could only dream of 2,000 armed members in revolt! Key personalities of interest to the American media. There was huge interest in the story of Countess Markievicz among the American press, with her ‘riches to rags’ story grabbing the public imagination. It was alleged by The Evening World in New York that she had shot six rebels who refused to follow orders, and they noted that “in mans clothing and flashing a brace of revolvers” she had led an attack on the Shelbourne Hotel. 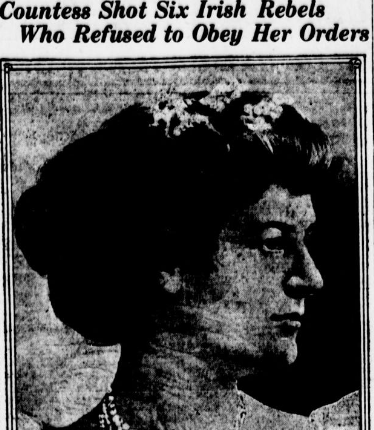 Allegations against the Countess repeated in a New York newspaper. Apples and oranges were laid on a table to make the letters “I.R.A.” and we all enjoyed ourselves for that evening as if we owned Dublin. Tom Cullen spoke there and said that we would all die forMick Collins, “not because of Mick Collins, but because of what he stands for”. Mick was persuaded to recite “The Lisht”, which he did with his own inimitable accent. When he was finished, there was a rush for him by everybody in the place to seize him. In later years Sullivan retired to Florida in the United States, but upon his death his body was taken to Dublin and buried in Glasnevin Cemetery. He is certainly a forgotten figure of the revolutionary period, and you have to wonder how with that kind of story! The response of Irish America to events in Dublin. The Kentucky Irish American makes its feelings known, May 1916. In New York, it was reported that a meeting of the United Irish League of America condemned the rebellion, but that it was interrupted by several men and women, while ‘outside of the hall’ scores cheered Sir Roger Casement and Germany and “loudly denounced John Redmond, leader of the Irish nationalists in the British parliament.” A meeting was held in New York in support of the aims of the rebellion, with a reported attendance of 1,500 in many newspapers. Deutschland Uber Alles, the Wearing of the Green and the American national anthem were all performed by a band, and leading figures of the Irish American community such as the exiled radical John Devoy spoke. It’s interesting that the newspapers would be playing the “German” card so heavily at the time. In November, Woodrow Wilson could run for and win the Presidency with the slogan “He Kept Us Out of War” which would suggest that most Americans would be ‘meh’ about it. A better angle, depending on the editorial intention, would be the labor/socialist/revolution fear. 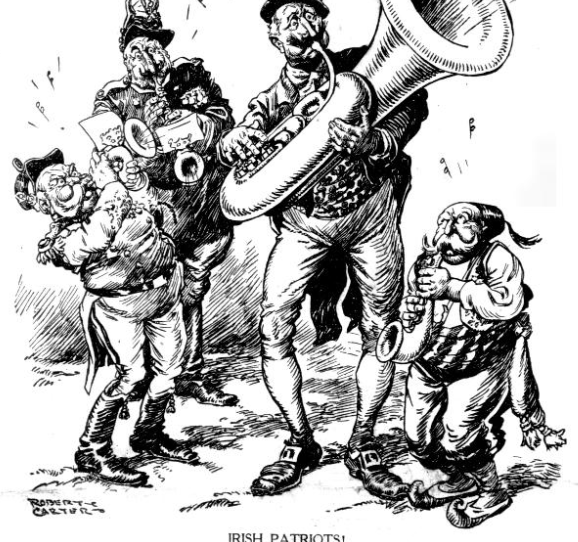 Hearst was enthusiastic in his support for Ireland by 1919. England was doing its best to induce an abstentionist America into the first World War. The emphasis on Germany’s heavy involvement in Irelands planned Rebellion was part of this inducement. The assertion in the proclomation by Patrick Pearse that Ireland would seek help from ‘our gallant allies in Europe’ among other sources, has been argued to be the greatest treachery the ultimate act of sedition making the execution of the surviving leaders a necessity. They have learned that politicially and every other way that this was a grave error. The partial or complete control of the media has always been key to government objectives. Society in Ireland today and how it accepts platitudes for all types of corruption and suppression of working class people through taxes and levvies is evidence of media softsoaping and doublespeak. I wonder about the accuracy of the claim that it …’was a German auxiliary cruiser, carrying a strong load of German sailors and loaded with stores of rifles and ammunition, was sunk off the coast of Ireland by British patrol warcraft.” Historical accounts suggest this craft having been boarded twice by British Naval forces was scuttled off the coast of Cork as it was being escorted to port. If it was under British control why would they let its German crew carry out this action? It is also questionable after reading of the meticulous planning of this Rebellion, why a mere few days is all that would have been available to land, distribute and train the Volunteers how to use these weapons before Easter Sunday as proposed. It would be a foolish shopkeeper that waited until Good Friday to stock his shelves with Easter Eggs and hope to have sold them by the weekend. An underwater and excavation of the site should establish whether the ship was scuttled or sunk or is this the same thing. Was the ammunition accompanying these rifles siezed in St Petersburg suitable? Its concievable in the light of what was happening in these critical times that Roger Casement may have been suffering from depression. on November 23, 2015 at 3:43 pm | Reply “Industrial anarchist of the most pronounced type” – 1916 newspaper report on the death of James Connolly. | Come here to me!